It is commonly said that we fear what we don’t understand. Living up to our American ideals requires us to understand our neighbors, our colleagues, and our friends despite our diverse backgrounds. Yet in recent years, Muslims in America have rarely been portrayed as nuanced and complex human beings, and most Americans say they don’t know a Muslim. Muslims for American Progress (MAP), a project of the Institute for Social Policy and Understanding (ISPU), aims to change this narrative. Through human stories and hard facts, MAP quantifies Muslim contributions in Michigan and New York City. Join ISPU and the Cathedral Church of St. John the Divine for a free event featuring the newest MAP data and two MAP NYC participants, actor Hisham Tawfiq (as seen on 30 Rock, Law and Order, and The Blacklist) and fashion photographer/spoken word artist Nicole Najmah Abraham. 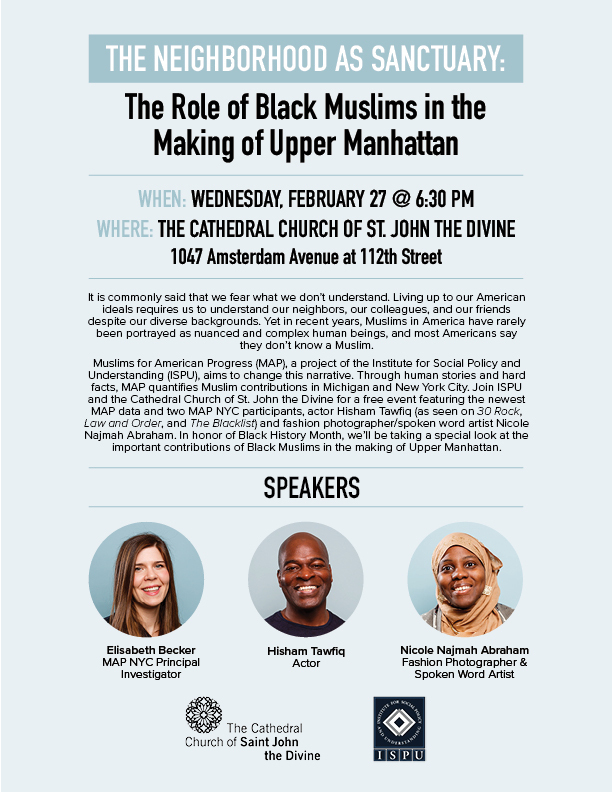 In honor of Black History Month, we’ll be taking a special look at the important contributions of Black Muslims in the making of Upper Manhattan.